3.5 stars.This book was something of a disappointment. It is interesting, certainly jam-packed with information. But it is bloated (700 pages of text), and it is structured around a basic premise that is not fully convincing. Parker is very smart. He knows a hell of a lot. But the book could have been half the length, and it would have been a more successful and readable work had it been.Parker starts with the long-standing debate about whether or not the 17th century represented a century of crisis -- one that separated the Medieval and Renaissance worlds from Modernity. The debate began (more or less) with a series of two articles by Eric Hobsbawm in (the Marxisante) British journal ‘Past and Present’ during the mid-50’s (articles on JSTOR); an important paper of H.R. Trevor-Roper (“The General Crisis of the Seventeenth Century”, P&P, 1959 – which is also on-line), and a number of conference collections published in the 1970’s, 80’s, and 90’s. This article by J.H. Elliott is useful in summing up the debate:http://books.google.com/books?id=C6gR...Parker believes that the 17th cen. was, indeed, a century of crisis, globally, largely brought about by the climate change connected with the so-called Little Ice Age. Part I discusses the Little Ice Age, and then describes the terrible consequences that followed in its train. At the beginning of this period, at the end of the Medieval Warming, the earth had reached a level of prosperity and overpopulation that left it rather unprepared for the sudden cooling that followed. The result of this cooling was frost and drought, floods, strong El Nino’s, weak Monsoons, etc., all of which led to widespread crop failures, which produced famine, which weakened the populations and left them more open to epidemics, and to the human jostling for limited resources known as war, rebellion, and the like. (Parker’s text contains often pages of quotations and examples that all say basically the same thing, so one can read this book quickly, in spite of its length, by skimming topic sentences. )Parts II and III then take up a series of case studies of societies that suffered drastically during the middle of the 17th cen. These are the Ming-Qing transition in China; the ‘Great Shaking’ of the Romanov’s and the Polish-Lithuanian Commonwealth; the Ottoman tragedy (1618-83); the Thirty Years War in Germany; the collapse of the Spain of Philip IV; the Fronde in France; and the Civil War(s) in Great Britain (two chapters). All of these societies were shaken to their core. Then he turns to a series that, for various reasons, were better able to withstand the Little Ice Age -- not unaffected by it, but not shattered by it either. These are the Moghuls of Shah Jahan; Sicily and Naples; the ‘Dark Continents’ (Africa, Australia, the Amerias); and, strongest of all, Tokugawa Japan. Parker’s treatment here is mostly straight forward narrative history – though he tries to weave in, sometimes artificially, specific references to the (admittedly, many) climatic catastrophes that marked these periods of time. Some of these case studies are interesting, some have too much detail and (for this reader) were dull – but readers can pick and choose which they want to focus on.Parts IV and V then discuss general topics including the roles played by Aristocrats, Clerics, different modes of collective violence, and the like.Finally, in chapter 22 – he addresses Kenneth Pomeranz’ theory of the Great Divergence, and offers an interesting take on it. According to Parker, the 17th cen. saw the rise of a new type of science that was ultimately connected with the development of induction and the experimental method, a movement associated with the likes of Francis Bacon (Novum Organum), Galileo, Descartes’ Regulae, etc. This is correct (imo). Parker, however, thinks this New Science was driven by attempts to cope with climate change. Parker is a good historian, but weak on the history of ideas, and his argument here is poorly developed and unpersuasive. For a much more reliable account of the roots of induction – which ultimately lie, via the Arabic regressus, in the dialectic of Socrates (as Bacon himself recognized), see A.C. Crombie’s excellent book here:https://www.goodreads.com/review/show...An interest in induction during the 17th cen., however, did not appear only in Europe. There was the Navya Nayaya of Sanskrit, the works of Xie, Chen, and others in Ming China, practical learning in Japan (partially stimulated by Dutch scholars resident in Edo and elsewhere). Descartes’s Regulae, in fact, was translated into Persian for the Mughals in the 1650’s.But it took off in Europe – and not in Asia. And the question is why? According to Parker, only Europe had developed an institutional infrastructure to foster the free exchange of ideas in the form of universities, museums, learned societies, and the like. In Asia, scientists worked alone and in isolation, under private patronage – and so, when they did discover something, it was a one-off, often by accident, and was not widely disseminated. But in Europe discoveries fed on one another because of these institutional infrastructures.This is, indeed, a plausible explanationAt any rate, an interesting book, but one that might have benefited from tighter editing, and from less of a reliance on the novelty of attempting to shuffle together (sometimes in a rather forced fashion) discussions of climatic with socio-political catastrophes. On the other hand, for those who are weak in the 17th cen., this serves as a useful and readable conduit. It started out well, but after a couple hundred pages a pattern had formed and wouldn't deviate.1) Pick a nation-state/empire.2) List all the droughts, floods, famines, and abnormally hot & dry (or cold & wet) seasons that affected said nation.3) Bludgeon the reader with a pedestrian recounting of said nation's military, political & fiscal history in the 1600s, often with redundant detail about said natural disasters.4) Repeat.I ended up bailing around page 450 (of 700 pages of text) because I'd totally gotten the point. Crops failed; everyone died. And the ruling classes were oblivious dicks.It's a shame this volume was so bloated. Multiple nations had the same experience IMO and could have been combined or, at the very least, the indigestible mass of Wikipedia-esque history rundowns for each country trimmed to the necessities. (Were the various interest rates in Naples really vital to know? )One of the things about this past 2016 election that irritated me most was the snarky ridicule of Bernie Sanders' pointing to climate change as a factor in the unrest in Syria. It's a premise that Parker's book backs up convincingly, only in a different era, and it's a premise that more people should recognize and ponder, both in its past and present manifestations. But Parker's presentation here makes the endeavor a slog.I might come back to it at a (much) later date and finish it up, when the repetition won't seem so fresh and painful, but it's going to be awhile. It did spark my interest in the Thirty Years War, so at least I got something out of it. 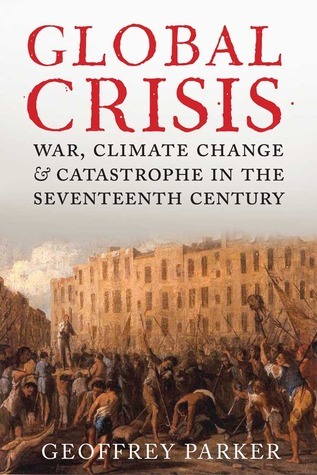 Immense yet deeply fascinating, Geoffrey Parker, Andreas Dorpalen Professor of History at Ohio State, has produced an eminently readable, fluently written history of the "Great Crisis of the 17th Century" and its connection to climate change. The 17th century was a time of great turmoil worldwide. Most people will know of the English civil wars and the European Thirty Years War at the time, but in fact war and revolution, in various forms, went on everywhere we have decent records - not just Europe and England, but Tokugawa Japan, China, the Ottoman Empire, Mughal India...the list goes on and on. Using his deep knowledge of primary sources, Professor Parker moves from region to region and crisis to crisis, laying out the causes, events, and resolutions. What's different about this book is that he ties the events into climate change. For there's something else generally known about the 17th century - it's remembered today as the "Little Ice Age," a period of dreadful weather that seems to be tied to sunspot variations amplified by volcanic eruptions causing global cooling, severe el Nino events, flooding, bad summers, heavy rain, droughts at times, and crop failures leading to immense death tolls and misery due to many areas that had been populated to the very edge of their food supply. While there have been suggestions before that the Great Crisis had some roots in climate change, Parker is the first to do a truly detailed study that ties worldwide weather into worldwide war and suffering (it's worth noting as an aside here that I recently read a very new book on the Thirty Years War that nowhere mentioned the Little Ice Age. Amazing.). It's not all horror; Parker points out how countries learned to ameliorate some of the effects of the climate disaster in its waning years. But his warning that we're heading straight into another "Great Crisis" caused by our own self-induced climate disaster coupled with overpopulation and the vulnerability of our supply lines is a timely one. Excellent reading; the notes and bibliography will be very useful for those interested in pursuing the topics further. OH MY G-D I FINISHED IT.It's absolutely fantastic but holy moly it took me longer to read this than it did War and Peace. Don't let that dissuade you, there's seriously so much good, well-researched stuff here, showing how climate change in one particular time period completely threw the world into chaos, but it would have been nice to know about how it would take me close to a month to read it before I started reading it.And now I'm like six books behind on my goal to read 100 books this year...oops. This is a big book, and when I say that, I mean, this is a BIG book: Over 750 pages of small text spread out over large pages with an extra 150 pages of notes and bibliography. To state the obvious, this is not a work that can be briefly picked up and then put down again. Rather it is a work to commit oneself to. It took me a month to complete it. It has a scope to justify the size. What Geoffrey Parker has attempted to summarize over half a century of scholarship on the so-called the Seventeenth Century Crisis. In historiography the crisis has its origin in the work in the 1950s by the likes of Hugh Trevor Roper and Erik Hobsbawm. They observed that in the middle of the Seventeenth Century a whole series of seemingly disconnected political crisis took place across the globe: In China the Ming Dynasty was overthrown, The Ottoman Empire collapsed into petty squabbling over who should be Sultan, the British Isles had a series of civil wars, a regicide, a republic and eventually a restoration, France, Iberia and Italy had a series of highly destructive rebellions that threatened but did not quite accomplish similar, Russia and Poland had events described respectively as ‘The Time of Troubles’ and ‘The Deluge’ which killed an approximately a third of their populations and those are hardly the only examples. Why did all these events seem to happen at once, peaking in the 1640s? Early historical researches, as was then fashionable, focused on all encompassing economic forces. Parker however has a different hypothesis. Focused little on the economy, indeed it is noticeable how little economic factors play in throughout the book’s pages, Parker sees in the crisis of the seventeenth century a crisis brought about by the climate. This is no idle speculation, Parker amasses a large chunk of evidence that bad weather, bad harvests, and extreme climatic events were a commonplace in the seventeenth century and were connected to the political turmoil of that period. Constantly Parker draws our attention to the climatic circumstances to the events he described finding almost unlimited quotes from contemporaries describing the weather conditions as unusually bad and then drawing back to the events leaving readers in no doubt of his conclusion. Parker it should be noted is no rigid environmental or climate determinist, large sections of the book deal with the political and social causes of the crisis, focusing on them so much at times he seems to undercut his own argument on the climate. In addition to his documentary evidence, and unlike some other climate historians, Parker cites tree ring data, pollen data, and even sun spots in favour of his conclusion. His research is quantitative as well as qualitative. He is also very thorough in his explanations of Early Modern life and how it related to the climate and what it needed from it, going into specifics and beyond the generalities.The book is divided into five parts. The first of which sets out his stall on the crisis, explaining what it was and how it had its roots in climatic changes as well as socio-political structures; there is quite a bit of data here to digest but by the end of it, it comes across as fairly convincing even though it is perhaps a bit overpacked with endless quotes on the same theme. The approach in this section is balanced between environmental and social causes for the crisis. In particular, the role of what he terms ‘the fiscal-military state’ in causing and perpetuating the chaotic violence of the period is outlined in some depth. Parker sees the violence of the period as generally state-and-soldier driven with the increase expense of war causing not just more deaths but more demands on the populace, leading to higher taxes and greater poverty at a time when climatic conditions meant people could least afford it, leading to rebellions and further violence. Alas Parker does not go into the state finance dimensions of the crisis (the role of taxation in each state is, for example, passed over) despite its clearly critical importance. Furthermore, Parker gives little agency to cultural forces such as religion and political ideology. It is a world where the climate is all important and after that, the state. Religion and ideology are regularly mentioned in passing but are not discussed as phenomena as such, despite the obvious roles in the crisis across many countries. For instance, one could have an analysis noticing the very deep similarities between the Turkish Kadizadelis, the Russian Old Believers and the English Puritans and attempting to understand what it was about the 17th century (or perhaps the human mind?) that made them so prominent but this opportunity is missed. Intellectual history is not one of the book’s strong points. However, Parker is stronger at looking at the role of ordinary people in the crisis and Chapter 4 – on methods of coping with and surviving the crisis is a particularly effective chapter looking at the various strategies from suicide to migration to infanticide to retreating into a religious life that individuals partook in to escape or avoid the worst of the disaster. He does not merely show the rational reasons behind these choices but also their consequences on both the individual and on the respective societies as a whole.This first section takes about one hundred pages. On the other hand the next two sections take the chunk of the book and are the real meat of the material. Fifteen chapters are dedicated to fourteen case studies of the crisis across the world. The second sections deals with those areas where Parker adjudicates the crisis was most severe: China, Russia, Poland, the Ottoman Empire, Germany, the Iberian Peninsula, France and the British Isles (two chapters dedicated to this one). While the third section concerns those parts of the world which, according to Parker, got off somewhat lightly from the worst of the seventeenth century: India, Italy, Japan, and what he terms ‘the Dark Continents’ (i.e. the Americas, Sub-Saharan Africa and Australia). As that list shows it is a very geographically diverse selection albeit somewhat Europe focused. Even within these case studies he brings attention to states not usually the focus of general histories such as the Scandinavian states, the Low Countries, Switzerland, Iran and Indonesia. Perhaps the continental South East Asia is only place that the book does not really at least attempt to cover although some regions – like the Americas – the discussion is somewhat cursory for what attempts to be a world history. With these case studies Parker pushes his arguments about the environment and social structure to one side and instead reverts to the history of events loading each chapter with a long series of descriptions of one catastrophic event happening after another. Some cultural and historic context is given for each place but only a brief overview rather here Parker is interested primarily in the details of what happened and its proximate causes. For those familiar with the events described there is not really anything new and it is obvious that Parker here, a historian of Spain and the Early Modern ‘military revolution’, is dependent solely on secondary sources. For areas I was familiar with, like England there are interesting and useful statistics and anecdotes but the overbearing narrative arch that Parker told was nothing new to me. However, I did learn a lot about events in Russia, the Ottoman Empire, India and other places of whose 17th Century history I knew little. The chapter of Japan I felt, with its focus on it being an example which escaped the worst of the crisis through state centralization and planning, was one of the stronger and more interesting of the case studies. Yet the parade of facts and events this dominates the central chapters of this book can be a bit overwhelming in the tradition of history books, a list of names and events lacking in a thick cultural or background description to fully understand what is going on. Understandable perhaps in a book so big and covering such a wide area but your mileage may vary, mine certainly did. The fourth and fifth sections of the book, covering the last two hundred pages, are a return to the general overview and thematic discussion of the crisis. The fourth section is less focused on the affairs of government and state but takes an eagle’s eye view on the causes of rebellion and resistance during the crisis, how people fought to survive, why did people rebel, and how was information exchanged both to cope and understand the crisis and also how to spread revolution. Unlike the high politics of state discussed in sections two and three, ‘ordinary people’ are the key characters led albeit often led by charismatic individuals or religious preachers. The work of James Scott who studied passive forms of peasant resistance to authority seems to have been very influential here as is, somewhat oddly, Malcolm Gladwell’s Tipping Point with its emphasis on small number of key individuals bringing about by their social roles radical change. As this is a humanities book Jurgen Habermas gets a nod to with a good discussion of ‘the public sphere’. Interestingly Parker ends it by discussing how much the events of the 17th Century crisis depended on a small number of actors and the vagaries of chance and contingency. Here the individual is inserted back into the narrative. The fifth and final section concerns the after crisis period and how states as well as individuals developed new ideas and new methods of attempting to avoid a repeat. Parker notes that at the end of the Seventeenth century and the beginning of the Eighteenth there was a revival in a global poor climate which coincided with wars, yet the consequences – while very poor – were not as severe as earlier in the Seventeenth century. Parker’s thesis in explaining this is that in the late Seventeenth century there was an increase in state provision of welfare which protected society from the worst of climatic disasters and stabilized the state preventing the rise of alternative sources of power. Some of his arguments here are persuasive but others are very glib, such as seeing the rise of tobacco and chocolate in same period as related to people retreating into themselves and avoiding the outside world rather than just the human love of a good time. This sort of theory gives social determinism a bad name. What is even more glib and unconvincing is his attempt in Chapter 22 to link the crisis to ‘the Great Divergence’ – the eventual gap which emerged in the 19th Century between Europe and the rest of the world - seeing out of the turmoil of the period the emergence of new intellectual ideas about the nature of life and universe embodied by the people such as Rene Descartes (Thirty Years War veteran) and Thomas Hobbes (influenced by his experiences in the English Civil Wars). However parts of this intellectual history are questionable (figures like Bacon, who are key here, precede the crisis while others such as Newton and Locke come after it) and does not really explain why this does not occur also in China. It reads all together as a classic attempt of a historian to relate all events in the perimeter of his favourite topic to his favourite topic, but here it is not necessarily so. However I will add that education is a minor theme running throughout the book and Parker is strong on the sociology of it if not the content and was full of facts I had hitherto been unaware of (Did you know that European Universities in the mid 17th Century had more students than they would have at any time until the late 20th Century? I didn’t). Overall, the book sets out to achieve many objectives several of which it achieves quite well and its essential point, its theory on the Seventeenth century crisis, is by the end of the book so engrained into you and argued such that there leaves little doubt, at least on the key role of climate. Furthermore many of its flaws are the inevitable of a book of this size and scope that touches on all kinds of matters with the author stronger on some points (the role of the state, for instance) and much weaker on others (the history of ideas). There are also some quibbles of my own, there is little comparison between the Seventeenth century and other centuries and thus the question is not answered: What made the Seventeenth century unique, was the crisis a one-off or a reversion to a running historical pattern. A comparison with the Fourteenth century would here have been apt although I can hardly criticize this book for leaving stuff out given the wealth of information (although personally I would have left out a lot of the minutiae of high politics. It has been discussed before and a lot of it was not necessary). Furthermore, Parker is sometimes too uncritical with his sources. There are endless amount of contemporary quotes on the unique terribleness of the age which Parker uses to prove how terrible it really was, but people always say that about the period they live in, even now in the era of laptops and iphones you have people arguing about the unique awfulness of our epoch. Present-o-centrism is a very common human trait and so I would have preferred to see less quotes and more quantitative data and comparison. I am also suspicious of anyone who frames their argument using theories from Malcolm Gladwell. Yet these are not major concerns for the most part. The epilogue dealing with contemporary climate challenges is worth reading and sobering. 4 stars. This 904-pages-long behemoth looked very promising from the beginning: I love works of Parker on the Military Revolution and the Spanish Army of Flanders. But while I read the book, my judgement had been going down gradually from 5 stars to 1. The main argument of connection between climate and social upheavals is not convincing at all and is refuted at many places by the author's own words. Worst of all, the exceptional character of the mid-17th century troubles is not proved at all because comparisons with 16th and 18th century are omitted. I remain with Niels Steensgaard, who wrote that the concept of a seventeenth-century ‘General Crisis’ has ‘become a synonym for what historians in other centuries call “history”'. The second fault of the book is that all chapters with an overview of some theme lack structure and are a motley collection of interesting facts and conclusions with unknown basis and questionable methodologies. Also, the author repeats himself a lot, which gets extremely irritant by the end of the book.The third fault is that a major part of the book consists of chapters on certain states, but that chapters are no better than Wikipedia articles and sometimes even worse. They contain the information that is well known to anyone familiar with the 17th century history. At some times these accounts are very biased and shallow (especially the chapters on Russia and England).Therefore, I do not find a reason for anyone to waste time with this book. If your are in search for an academic research - there are deeper articles and monographs. If you want a concise history of the world in the 17th century - there are livelier and more objective accounts. Noticed Boston Globe story on this book at http://www.bostonglobe.com/ideas/2013.... Looks really interesting. If there is something that Geoffrey Parker doesn't know about the 17th century, it must be because nobody else does. The sheer amount of research, scholarship and (for want of a better word) summarization that went into each paragraph, if not each sentence, just astounds me. I would read a sentence and think "well that knowledge would've taken me a few days to gather and collate." But the facts, conclusions and insights just keep coming.The title gives it away: Parker has staked a claim that the crises of the 17th century that basically rocked all the civilized world at one time or another, could be tied in part to persistent weather developments that were out of the ordinary - floods, droughts, cold and typhoons. The examples he gives are hard to deny - from the Ming/Qing dynastic wars to the English rebellion. The common denominator is that the climate change caused a disruption in the way of things that are assumed to stay the same - crops, taxes from the crops, food distribution from the crops, new illnesses from malnutrition/plagues. How these disruptions are handled by the various polities is what determines whether the crisis can be weathered - or if it turns into a revolution, war or famine.Parker gives well researched examples of leaders/governments that failed to do this at all (Charles I was really a failure all around) and those that were good at mitigation (the Japanese Tokugawa were exceptionally enlightened). It seems the main thing that it takes is that those in power realize that climate change can affect *everything* and cannot be ignored. A famine must be met head on and not used as an excuse for higher taxes (yes, many governments seemed to think that since tax revenues were going down, then higher taxes are the answer...). The regions that came out the best from the climate changes were those that concertedly saw the importance, did society-wide mitigation and held on through the crisis. The regions that declined were those that tried to score political points or outright ignored the suffering. That suffering climbed up fortune's ladder until no-one was immune - leaders toppled, countries invaded, populations wiped out.Of course, these arguments are only academic and irrelevant to present times because we have enlightened leaders such as James Inhofe of Oklahoma who have recognized that the colossal importance of climate change to all the people of the world in the present and the future is secondary to profits of oil and coal companies of the next few years. Nope, nothing to learn from the horrendous history of the 17th century - Inhofe and his cronies think Santayana was a hippie rock group. This is a magnificent book that looks at the social, cultural, and political impact of the Little Ice Age, and particularly the seventeenth century. One of the great things about this book is that Parker doesn't limit himself to Western Europe--he spends a good percentage of the book commenting on circumstances in Mughal India, the Ottoman Empire, and Ming/Qing China. He also devotes some time to Australia, Africa and the Americas, though as he points out, the historical record for those areas is limited. But with scientific advances like ice cores, tree ring chronologies and pollen samples, it's possible to build up a picture of the climactic devastation involved, and the results are almost uniformly grim. It's a significant, eye-opening book, and one that can serve as a dramatic warning for anyone willing to pay attention. He leído ya bastantes libros de historia y creo que este es uno de los más completos y entretenidos que me he encontrado hasta ahora. Un libro que te lleva desde España hasta China pasando por la India sin pestañear para mostrarte todo lo que pudo salir mal y salió mal en una época tormentosa.Muy recomendado. Monumental in writing and research and staggering in its account of the seventeenth century little ice age. If you are pondering or denying the impact that a few degrees change in average temperature can have on the world - then read this. This is a rare book and if you are demanding the Readers Digest version or want it 'on a page' then you are missing the point. This book was disappointing. The first third provided great setup with a good overview of 17th century history, but the rest failed to deliver on the promised thesis. Rather than showing that climate change drove the Global Crisis, Parker merely demonstrates that climate change exacerbated existing conflicts and trends. It's worth reading for the first section; I wouldn't keep going after that. An amazing well-researched, well-referenced, well-indexed throughly academic work. Unfortunately, I couldn't it give it four stars because it's organised in what seems to be a bit of a rambly, haphazard fashion.Perhaps to set it out geographically would have better suited it.In any case, each sections seemed to have much the same lack of structure, becoming a litany of the chronological coincidence of social and meteorological catastrophes.You have to admire his scholarhship though, that's for sure.What an undertaking! "Big Data" is a current buzzword in the software industry, but its popping up all over, and turning out to be at least as useful in the humanities as in the business world.Using computers to store, organize, search, filter and sort the historical record is an art still in its infancy, but it is already bearing fruit. Geoffrey Parker's "Global Crisis" is almost certain from the tree of Big Data: the depth, breadth and complexity of analysis would simply not have been possible without advances in modern technology.That said, this is not a dry book of numbers. Parker brings to life the people and the times, examining the crisis from as many perspectives as possible. It is very clear from the data that the climate crisis of the 17th century was indeed global: it was not some minor aberration restricted to Western Europe, unless events in Western Europe caused crop failures and historic-record weather events in China during the Ming-Qing transition.As much as one third of the human population died in the 17th century, which saw massive sequential crop failures at different times all over the world, and lacking global trade there was no way to move food from unaffected to affected areas. Until global capitalism really got its feet under the table in the 20th century there was simply no way for humanity to address a crisis of this magnitude.Records--including official, personal, and natural--across the world show that between 1620 and 1680 there were extreme climate events at far higher frequency than in any other period of human history, and political responses to them were almost uniformly wrong-headed, favouring top-down dictatorial absolutism over distributed democratic control. The abject failure of top-down absolutism on every front set the stage for the more pluralistic, tolerant modern world, where global capitalism eventually was able to do what no other economic system anywhere ever was able to do: actually generate enough wealth to feed the entire human population, and relegate famine to causes solely political, generally caused by partisan absolutists, both Marxist and Fascist.The book is magesterial in scope and extremely long, clocking in at almost 1000 pages with several hundred pages of references and notes. The same events are covered from multiple perspectives, which does allow a certain amount of skimming, but the insights come thick and fast. Contingency is emphasized, but it's hard to argue with statistics: of the dozens of revolutions that promised to "change everything" in the 17th century, exactly one succeeded, the revolt of Portugal against Spain. From this, we can reasonably conclude that anyone who suggests the appropriate response to any modern crisis is a revolution that "changes everything" is either an historical ignoramus or a flipping idiot. Possibly both.It's also fascinating how the same dysfunctional impulses affected both governments and revolutionaries the world over. Governments became more authoritarian (because that always works so well) while revolutionaries not only focused on egalitarianism, they actually used the same terms ("Levelers" in England, "Leveling Kings" in China) to describe themselves. Unsurprisingly, the leveling impulse was as pointless and stupid as the authoritarian impulse it opposed.Human economies are highly dependent on relatively stable background conditions. In the face of the global climate instabilities--partly due to volcanoes, partly due (probably) to the Maunder solar minimum, partly due to internal feedbacks--the global economy of the 17th century faltered, and huge numbers of poeple died.Today we plausibly face a similar period of unstable climate, mostly due to human activity, and particularly thanks to the successes of anti-nuclear activists in the 70's and '80's, who did everything they could to ensure it was impossible to replace base-load coal with safe, clean, efficient modern nuclear power plants. Although thanks to our integrated global capitalist economy we should be much more robust agasint climate change than the 17th century was, we are still likely going to face hardships, and this book will give a sense of the kinds of things that we know can and do happen, because they have happened before. OK, I didn’t read the whole book. I just came off of Geoffrey Parker’s “Europe in Crisis 1698-1648,” which covers a lot of the same territory (and uses many of the same descriptions and examples). I skipped around in this one, read the parts that interested me most. It’s a very readable book, and a valuable contribution to global environmental & political history. In the Prologue, Parker lists other past climatic disruptions that have affected human societies on a global scale. He mentions the “drought on both sides of the Pacific” that fatally weakened the Tang in China and the Maya in Central America, and cites an article that speculates that changing monsoon patterns may have had something to do with it. In fact, we know better than that, though neither Parker nor the Nature study author seems to be aware of it. Not to fault Parker, who had lots of other information to keep track of, but “Catastrophe,” by David Keys, sets out a very convincing case for environmentally-induced climate effects (not caused by monsoons) that disrupted not only the Tang and the Maya but many civilizations throughout both hemispheres—the “dark ages,” as we call it. This is an exceptional history book about a known, but little discussed, period of 17th century history known as the "Little Ice Age". Professor Parker goes into great detail about the havoc that climate change caused on the nations of the world. This is a thick and fascinating read that does not have a boring page. Don't let the length of the book scare you away. It is worth the time and the investment to read. A mammoth book, where in practice you could skip the country chapters if you wanted and just read the first and last sections to get the global picture. That can't take away from the scholarship of this work though - an excellent book that threads together economics, politics and the environment. Both an excellent history of the century with the most extreme weather and also a useful lesson for policymakers today. This book spends 500 pages giving a relatively detailed history of the world during the 17th century. It covers how climate changes led to reduced crop yields which led to rebellions. It also discusses the other causes of the various wars which occurred in almost every country in Europe and Asia for almost the entire century. It was definitely worth reading. This is a very interesting book about the impact of Climate Change ( a mini-ice age) during the 17th century. It looks at how history was impacted on a regional basis.Though interesting this book takes time to get through. I couldn't read more than one chapter at a sitting.Has some lessons for us today in light of climate change. It's chapter about Ottoman Empire is very solid and accurate.